One can create a constant maturity treasury (CMT) by building a zero coupon discount curve and generating constant maturity bonds from that curve. This allows one to look further back than is possible with the current 'actual' existing bonds. I was told that CMT bonds account for modified duration, whereas actual bonds do not. The CMT bond accounts for modified duration precisely because it is created using a zero coupon curve. if you use existing on the run bond yield for analysis. There are at least three ptoblems. I'm just guessing, but they might be talking about the continuity of time series. 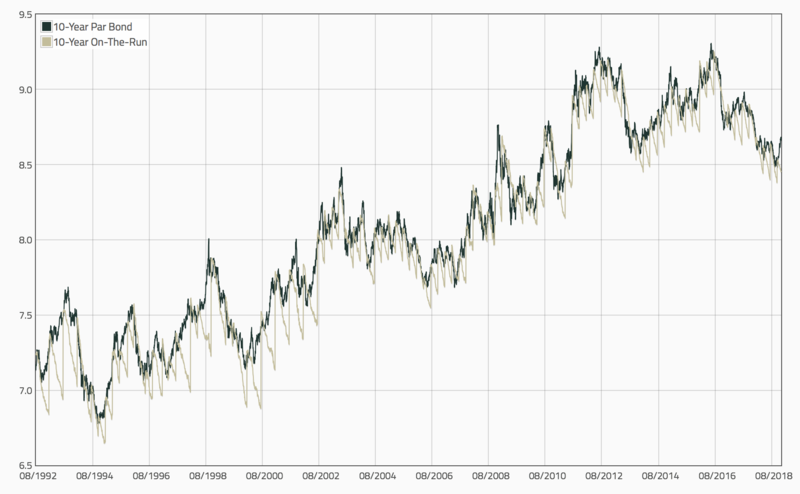 The chart below shows the modified durations of 10-year par bonds and rolling 10-year on-the-run Treasuries. As you can see, they have the same trends (as expected), but you don't have those jumps (caused by new on-the-run 10-year issues being issued). Not the answer you're looking for? Browse other questions tagged fixed-income bond zero-coupon curve-fitting or ask your own question. What techniques can be used to get the missing maturities from the CMT yields?